A very gray photo, but it's important to the tale I'm telling about our journey to the ice in British Columbia a long time ago. Looking ahead, you can see the full-size river bursting out from under the glacier, but can you tell where rock ends and the debris-laden ice begins? This photo was taken about ¼ mile beyond Last Valley Camp, which was used by most of the early climbing expeditions on the Franklin. 18 years before we came, the group who actually achieved the first ascent of Mt. Waddington reached Last Valley Camp. After a couple of days of bushwhacking carrying 90 and 100 lb. packs, the climbers were exhausted. They took a layover day. The next morning the man who was the designated cook for that day, still worn and tired, opened a box of oatmeal and screamed. The box was only 3/4 filled with food. The rest of the space was occupied by a large dinner plate decorated with pink roses. In those early days before there was specialized backpacking food, the climbing party was carrying a lot of oatmeal. Box after box was opened, and each had a heavy plate inside. When Larry and I reached Last Valley Camp in 1952, it was no longer so close to the snout of the receding glacier. But one thing had hardly changed. 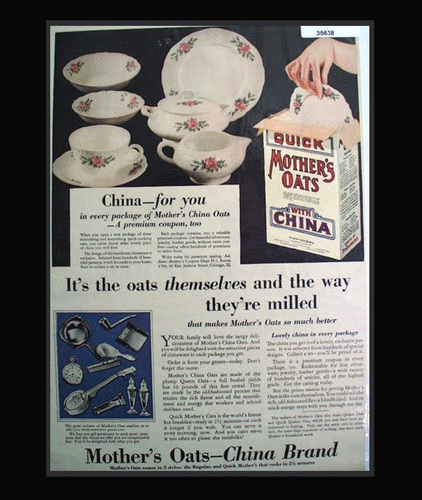 Now permanently embedded in mossy crotches of the young trees around us were the famous oatmeal premium plates.